The Law Firm of Richard A. Hostetler consists of a sole practioner lawyer who possesses a rich background of experience in courts, in a two-attorney law firm and now with the flexibility of an independent practice. As a former public defender, he understands the "in's and out's" of criminal defense cases of all kinds, from petty thefts to violent crimes, such as sexual assault and homicide. As a former law clerk for Judge Coyte in the Colorado Court of Appeals, he has an in-depth understanding of appellate law, unlike that of many other trial lawyers. 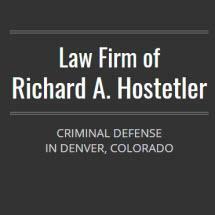 Only a handful of attorneys are equally competent at trial law and appellate law, and Richard A. Hostetler is one of those few serving defendants in criminal defense cases at the trial level as well as in the appeals process in Denver, Colorado along with other Rocky Mountain locations such as Wyoming. Despite his distinguished legal background, Richard A. Hostetler doesn't delegate work on his cases to office staff. Rather, he remains a hands-on lawyer who controls every detail of every appellate case he works on. From typing and scheduling, to preparing complex appeals strategies, Mr. Hostetler applies his talents and energy, personally, to every aspect of every client's criminal defense case, including the post-conviction phase. Richard A. Hostetler stands ready to tackle new appeals cases in search of better justice for cases of murder, felonies, sexual assault, drug offenses, and white-collar crimes such as embezzlement or fraud. Should he decide to consider your case, you may opt for (1) an initial consultation to discuss possible grounds for appeal of your case, (2) a more in-depth investigation and evaluation of your appeals concern with the goal of being able to make an honest appraisal of the potential for winning an appeals case, or (3) a fully litigated appeals case that may go as far as the Colorado or U.S. Supreme courts.